Stir together flour, sugar, baking soda, spices, and dash black pepper. In large saucepan, combine molasses and butter; heat and stir until butter melts. Cool to room temperature. Stir in eggs. Add dry ingredients to molasses mixture; mix well. Cover. Chill several hours or overnight. Shape into 1" balls. Place on greased cookie sheet. Bake at 350 degrees F (180 degrees C) for 12 to 14 minutes or until cookies are done. Remove. Cool. Roll in powdered sugar. Not at all like traditional Pfeffernuesse. Dry, not very much spice flavor, and much too much molasses. Would not make again, will continue to look for better recipe. The dough is a bit stiff to work with but the results are excellent! This is a spice cookie with a wonderful little "bite" that develops the main spice flavor. Excellent with a cup of hot tea. Good, but nothing special. Neither spicy nor traditional. 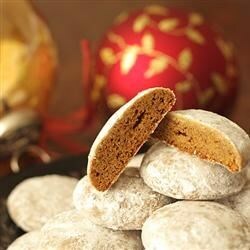 Molasses Crinkle recipe is much better than this molasses-based cookie! These were so good. I loved the spice and loved the low sugar. It was so delicious.